We were all there at one point … rolling into Breckenridge for the first time. Like the rest of us who initially learned the lay of the land, you’ll probably love it so much you’ll either never want to leave or will want to book your next vacation before this one is finished. That’s altitude, NOT attitude. Chances are your spirits are brimming about your first Breckenridge vacation. But in order to maintain that magical mood, be sure to prepare yourself for life at 9,600 feet (at the lowest point). This means drinking a lot of fluids – water, sports drinks and tea – and keep your alcohol consumption to a minimum. This will help you acclimate. Mountain Sickness is a very real thing that doesn’t discriminate about who it comes after. Even super fit, professional athletes sometimes struggle at this elevation with shortness of breath, weakness and even dizziness and nausea. It’s best to ease into activities rather than dive into six straight hours of steep mogul runs. If you do find yourself wheezing or wobbly, there are a few places in town specializing in an oxygen fix – The O2 Lounge, Alpine Oxygen and 24-hour Oxygen. It’s amazing how much it helps. From extravagant base area hotels (like Grand Lodge on Peak 7 , One Ski Hill Place) to backcountry cabins and bed & breakfasts, from self-service condos to simple hostels, there is every possible type of home away from home in Breck. Use Breck’s Lodging Finder to shop for options. Every outfitter in town has a solid, highly varied lineup of boards suited to skiers/snowboarders of all sizes and ability levels. 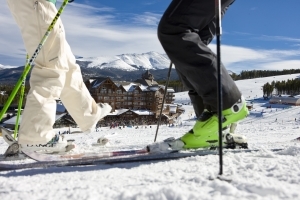 Operated by Vail Resorts, Breck Sports has a whopping seven locations around town and the family-owned Alpine Sports has three locations that offer a free shuttle service from anywhere in Breck to their stores and also pick up equipment at the end of your stay. Both companies rent out new, state-of-the-art gear each season. As you probably noticed by looking at the trail map, Breck covers a LOT of territory. So where should you possibly begin? Peak 9 offers an abundance of beginner slopes and Peak 7 is a vast playground of intermediate runs. The resort is naturally divided with most of the beginner and intermediate trails located near the bottom of the ski area and the steeper, black and double black terrain awaiting rippers at the top. If you’re a first-timer not only to Breck but to skiing or riding in general, taking a lesson is a really, really good idea. Breckenridge’s Ski & Snowboard School offers an incredible variety of group and private lessons to children and adults of all levels. One key characteristic that sets Breckenridge so far apart from (and above) many other resorts is that it is a real town. It’s a real town with a lot of history, character, great bars, shops, restaurants, spas, entertainment options and even its own incredible Arts District, offering everything from pottery classes to live music and festivals. The Breckenridge Recreation Center houses one of the best indoor climbing walls in Colorado and hosts numerous fitness classes as well as child care. That’s not to mention the myriad of activities ranging from the adrenaline variety -ziplining, riding the alpine coaster and snowmobiling – to cardio-charged pursuits like cross-country skiing and snowshoeing to cultural activities like whiskey tasting, historic mine and haunted house tours. Here’s a comprehensive activity list of most offerings. Another beautiful bonus in Breck is the free bus system. Frequent and reliable, Breck Free Ride covers the entire town with eight total routes, one for nearly every street corner. Combine that with the free Summit Stage bus system, which serves all of Summit County from Breckenridge to Frisco, Keystone, Silverthorne and Copper Mountain and then with the Colorado Mountain Express, which runs shared shuttles and private cars to and from Denver International Airport all throughout the day and night, renting a car is simply not necessary. As a local, I also advise visitors to take a couple of aspirin their first night here, to help with altitude headaches, etc. Also, on the mountain I recommend newcomers try the Ski WIth a Ranger program to learn more about our local ecosystem (see: http://www.breckenridge.com/mountain/ski-with-a-ranger.aspx). And for non-skiers, I would add a recommendation for the Ice Arena (see http://www.townofbreckenridge.com/index.aspx?page=1067).